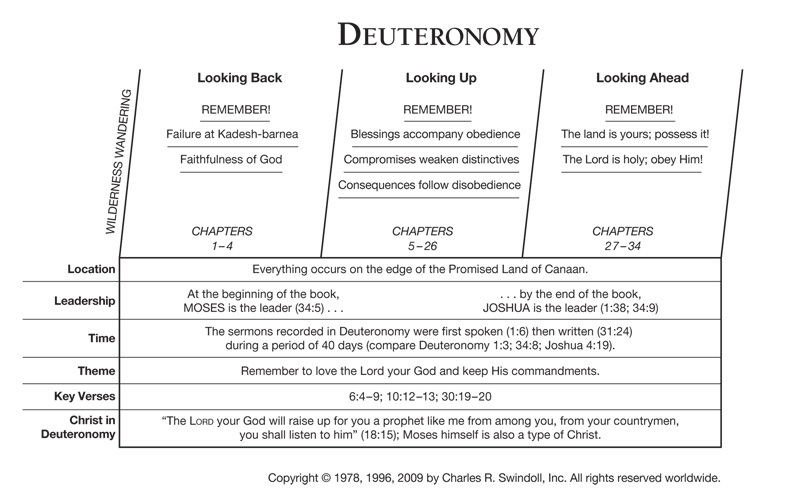 Deuteronomy means “second law,” a term mistakenly derived from the Hebrew word mishneh in Deuteronomy 17:18. In that context, Moses simply commands the king to make a “copy of the law.”1 But Deuteronomy does something more than give a simple copy of the Law. The book offers a restatement of the Law for a new generation, rather than a mere copy of what had gone before. Deuteronomy records this “second law”—namely Moses' series of sermons in which he restated God's commands originally given to the Israelites some 40 years earlier in Exodus and Leviticus. “These are the words which Moses spoke to all Israel,” says Deuteronomy 1:1. Mosaic authorship of this book finds the usual support from Jewish tradition (with the entire Pentateuch) but also from within the biblical text. Several times, Deuteronomy asserts Moses as author (1:1; 4:44; 29:1). Speaking to Joshua, Moses' successor, the Lord referred to this “book of the law” as that which Moses commanded (Joshua 1:8). And when future Old Testament and New Testament writers quoted from Deuteronomy, they often referred to it as originating with Moses (1 Kings 2:3; 2 Kings 14:6; Ezra 3:2; Nehemiah 1:7; Malachi 4:4; Matthew 19:7; Luke 20:28). Deuteronomy was written around 1406 BC, at the end of the 40 years of wandering endured by the nation of Israel. At the time, the people were camped on the east side of the Jordan River, on the plains of Moab, across from the city of Jericho (Deuteronomy 1:1; 29:1). They were on the verge of entering the land that had been promised centuries earlier to their forefathers (Genesis 12:1, 6-9). The children who had left Egypt were now adults, ready to conquer and settle the Promised Land. Before that could happen, the Lord reiterated through Moses His covenant with them. Find resources in the book of Deuteronomy in our resource library.